As a Muslim woman, it’s hard to come by Muslim artists who create epic work which not only complements Islam but can also give us a teaching moment. That’s why Muslim Girl is creating profiles of artists so that you won’t feel left out of the creative scene. 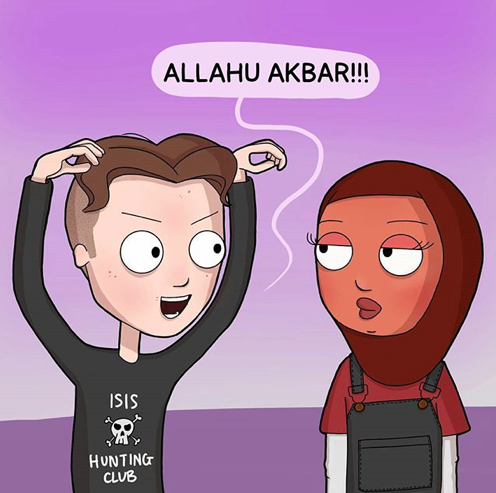 MVZLAMIC is a comic artist on Instagram who is quickly winning our hearts. Her Insta stories keep us “woke” while her comics keep us in awe of her talent. As an artist myself, I was honored to have collabed on a comic with her about niqab. She listens and carefully researches the subject matter and is ready to do the emotional labor for marginalized individuals without asking anything in return. Muslim Girl: Please describe your art style for the readers. MVZLAMIC: I can’t say I’ve tried to develop my own style yet. You’re looking at a work in progress. I’d say my “style” is an unconscious product of pop-culture, where I’ve drawn on some of my favorite childhood cartoons. To emphasize the lack of any kind of artistic process, I should point out that everything on my account is the only art I’ve created in its style. There was no trial-and-error leading up to my first post of a skateboarding hijabi. My viewers are seeing the first and final draft. I suppose I consider myself more of an activist than an artist on my current platform. I love to draw and I love experimenting, but I can’t say these have been priorities for me since the conception of MVZLAMIC. I feel I have a long road ahead of me that will undoubtedly involve style development and exploration, which I’m very excited to pursue. But right now I’m more interested in getting a message across than communicating my own brand of art style. How does your Muslimah identity influence your pieces? My identity is the driving force behind my content; my experiences as a Muslim woman of color fuel my thoughts. Every piece is about making Muslims, particularly women in our faith, feel happier, safer, seen, heard, validated and humanized. The most important part of my Muslim identity is the precedence of Islamic philosophy in the way that I perceive this world and everything in it. A huge part of this philosophy is the concept of justice, righteousness, mercy, and all things good that we owe to ourselves and to one another for the sake of peace. It’s because of this that I try to make every one of my pieces count towards fighting an injustice, whether it’s by outing the ingrained bigotry in parts of our societies through comics, or by simply celebrating the existence of those who are underappreciated in silent portraits. What advice do you have for Muslim artists to develop creatively in their craft? The best way for anyone to hone in on their craft is to practice, practice, practice! Experiment, learn from others in your field and take constructive criticisms on board. The key thing is to persist, which can be difficult for Muslim artists who dabble in visual arts, as they can expect the backlash from both Muslims and non-Muslims. Maybe an Islamophobic viewer will see your Muslim-themed artwork and take the opportunity to spout bigoted hatred or start a political debate about your existence. Maybe finding a platform or opportunities to share your art will be hard to come by because representation is an ongoing struggle for minorities. Maybe a Muslim will use your work to critique your faith, to make you question yourself and your worth by shaming you for not conforming to their understanding of Islam. Why do you think art can help break false narratives? Art is a powerful medium for communicating experiences and emotions. It’s the preservation of voices, stories and messages that can inspire and inform the evolution of minds. To break false narratives, we must share ourselves with others, and that’s exactly what art allows us to do. Tell us 5 facts about yourself no one knows. 1) It may come as a surprise to 99% of everyone I know because I’m (almost) a completely different person now, but as a teenager, I was a hijab-wearing punk rock fangirl that dreamt of eloping with a famous guitarist. 2) I have trypophobia (if someone made a horror film about holes, it’d be the first time I’d refuse to watch something out of genuine fear. I can handle serial killers, carnivorous clown-demons, and possessed children, but cluster circles? Never). 3) I hate ice cream (too cold). 4) I keep a journal, not because it’s a way of expressing myself but because my memory is the worst and I need to write things down before I forget them. 5) I consider myself to be a self-sabotaging underachiever in pretty much every area of life (I haven’t psychoanalyzed the reasons behind this yet). It’s hard to get things done the way I want them, if at all.